← What’s the buzz? Tell me what’s happening: A conference on ethics in mathematics. Internalist and externalist accounts of mathematical history. Hottinger distinguishes internalist and externalist traditions of writing histories of mathematics. The internalist approach is most widely used with representations of mathematics as universal and discovered, resulting in the de-centering of individuals and social contexts associated with mathematical knowledge production. Texts presenting internalist historical accounts, for example, often reserve insights about biographies and cultures on side margins or at the end of chapters. 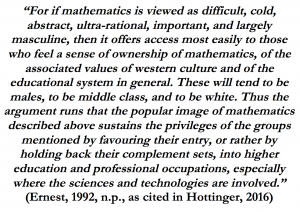 Thus, Hottinger argues that the prioritization of ideas over individuals in internalist histories of mathematics result in the disappearance of mathematical subjectivities. Externalist histories are written with representations of mathematics as a human activity situated in cultural and historical contexts. With such foregrounding of individuals and their progress in mathematical knowledge production, texts presenting externalist accounts of history are often organized chronologically and incorporate relevant biographical insights in discussions about the development of mathematical ideas. Hottinger draws on David Burton’s The History of Mathematics: An Introduction (2010) as an illustrative example of an externalist text. While Burton’s text “humanize[s] the history of mathematics” (p. 63) through the centering of individuals and social contexts, Hottinger argues that this externalist account also limits constructions of mathematical subjectivity through portrayals of mathematicians as heroic figures. Burton’s (2010) representation of Isaac Newton, for example, illustrates how a mathematician’s subjectivity is constructed in alignment with discourses of mathematics in Western culture – namely, “difficult, cold, abstract, ultra-rational, important and largely masculine” (Ernest, 1992, n.p.). Thus, Newton is represented as an “ideal mathematician” (Hottinger, 2016, p. 76) and thus perpetuates gendered, racialized, and other socially restrictive opportunities for identifications with mathematics. Historically humanizing undergraduate mathematics education. With recent calls for (re)humanizing mathematics education (e.g., Goffney & Gutiérrez, 2018; Mukhopadhyay & Greer, 2015), Hottinger’s analysis of mathematical subjectivity across internalist and externalist accounts brought me to consider how undergraduate mathematics educators can leverage her insights to (re)humanize mathematics, including students’ mathematical learning experiences. Narrow conceptions of mathematics and mathematicians through written histories can frame institutional practices in undergraduate mathematics education that produce inequitable opportunities to learn and identify with the discipline. Thus, I encourage undergraduate mathematics faculty to critically reflect on pedagogical possibilities for more humanistic presentations of mathematics and its history that motivate what Hottinger (2016) calls “feminist ‘aha’ moments” (p. 5) among students. Such moments provide undergraduate students a new lens for making sense of themselves, including their mathematical subjectivities and positions in the world. For courses about the history of mathematics, to what extent do adopted texts and your pedagogical use of them overcome limiting constructions of mathematical subjectivities across internalist and externalist accounts? Which Indigenous, non-Western figures and their contributions to mathematical knowledge production are represented in biographies explored throughout the course? How might the positioning of individuals or groups as mathematicians in the course reify the exclusionary image of the “ideal mathematician” and “trope of the great hero” (Hottinger, 2016, p. 76) by Western standards? In what ways do classroom participation structures promote hands-on, collaborative learning that challenge racialized, gendered norms of abstract thinking, individualism, and competition in mathematics toward broadening opportunities for building positive mathematical subjectivities (Battey & Leyva, 2016; Leyva, 2017)? Battey, D., & Leyva, L. A. (2016). A framework for understanding whiteness in mathematics education. Journal of Urban Mathematics Education, 9(2), 49-80. Burton, D. (2010). 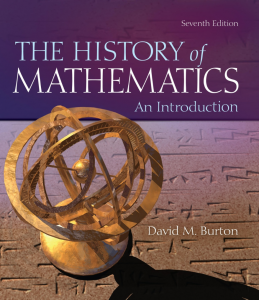 The history of mathematics: An introduction (7th ed.). New York, NY: The McGraw-Hill Companies, Inc.
Ernest, P. (1992). The popular image of mathematics. Philosophy of Mathematics Education Newsletter 4/5. Goffney, I., & Gutiérrez, R. (2018). 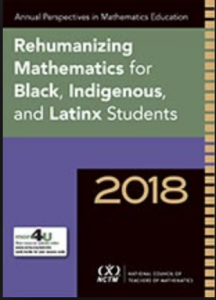 Annual perspectives in mathematics education: Rehumanizing mathematics for Black, Indigenous, and Latinx students. Reston, VA: National Council of Teachers of Mathematics. Gutiérrez, R. (2017). Living mathematix: Toward a vision for the future. Philosophy of Mathematics Education Journal, 32(1). Hottinger, S. N. (2016). Inventing the mathematician: Gender, race, and our cultural understanding of mathematics. Albany, NY: State University of New York Press. Leyva, L. A. (2017). 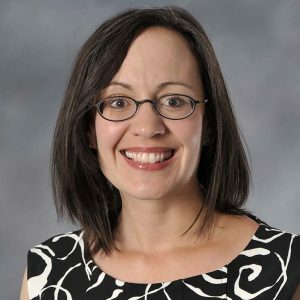 Unpacking the male superiority myth and masculinization of mathematics at the intersections: A review of research on gender in mathematics education. Journal for Research in Mathematics Education, 48(4), 397-452. Mukhopadhyay, S., & Greer, B. (2015). Cultural responsiveness and its role in humanizing mathematics education. In K. Krainer & N. Vondrová (Eds. ), Proceedings of the Ninth Congress of the European Society for Research in Mathematics Education (pp. 1624-1629). Prague, Czech Republic. This entry was posted in culture, equity, feminist theory, history of mathematics, math education, teaching. Bookmark the permalink. Nice information shared by you and thanks for sharing this useful information with us. “TMCF | Mcdonald’s True To the HBCU Scholarship”. The scholarship is available to outstanding undergraduate or graduate students attending one of the 47 publicly-supported Historically Black Colleges and Universities.